It’s as true now as it was 150 years ago: the fashions people wear are indicators of their times. In fact, styles of clothing and accessories — as well as hairstyles and makeup — can be used to help you assign a decade or even a specific year to your family’s vintage photographs, which can be invaluable to your genealogy research! Here are several sites that can help you put your aunts, uncles, cousins and grandparents on the right branches of your family tree. 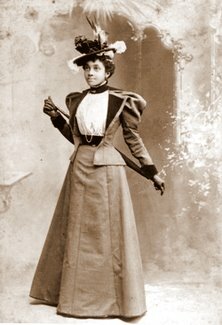 Columbia College in Chicago has a great collection of women’s clothing which document historic styles, revival fashions and period details of what was in vogue during the 20th century. The London’s museum’s helpful section on dating clothes and photographs uses items from the V&A’s collection to illustrate the dominant trends of the decades between 1840 and 1960, and is helpful even when investigating photos taken outside Great Britain. Even if you think you’re on the right track, identifying fashions can help you confirm information. 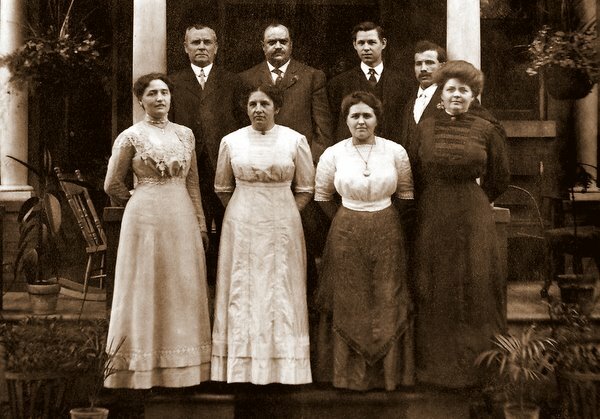 For instance, the portraits at right were labeled, so I know them to be my grandmother’s two grandmothers — and the photo albums they came from suggested that the photographs were taken in the 1880s or 1890s. 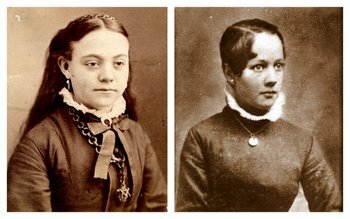 Despite the womens’ different cultural backgrounds and individual tastes in fashion, the similar type of high, standing collars suggest that they’re on the earlier end of that time frame, most likely the mid-1880s. While all the clues you gather from appearance can be very helpful, they’re not always precise. By way of example, your relative might have been a trendsetter… or perhaps she cared little about fashion and was always a few years behind. Location (city or country, US or abroad) and income level can also impact a woman’s style choices. By combining various modes of research, however, you should be able to discover the essence of the era — and your family’s place within it.